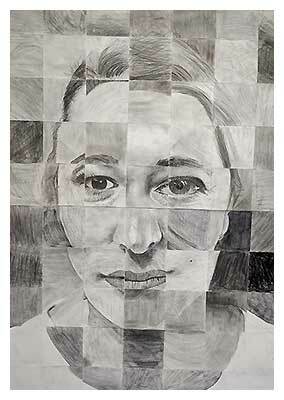 Inspired by the work of Chuck Close and utilising his grid technique. Ms Nunes’ year 7 class set about creating a large realistic portrait of our new deputy principal Samara Chisolm in graphite pencil. 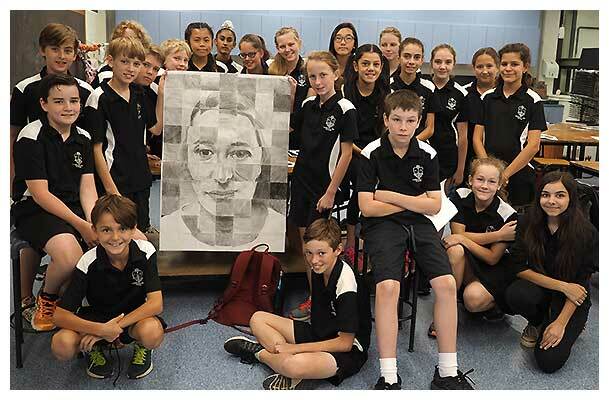 After learning about how to apply form and tonal range using graphite, each student was given a small square piece of a photograph of Ms Chisholm, they then individually drew this onto a larger piece of square paper. Some of the more confident students completed one or 2 of the more detailed squares and others contributed several of the simpler squares each. They then pieced the portrait together and presented it to Ms Chisholm. Overall it was very successful. Students collaborated with each other, organised their own work and created a fantastic finished portrait, which will hang in Ms Chisholm’s office and be this terms feature artwork.